Today we weaved a fish out of harakeke. First we made a big loop. Second we put the other on the front of a top weave put it though. Next we turn it and put though the loop. Then we turn like a ballerina. Now you have a star. But it's not yet. Then we cut one of them to be the fens and two of them to be the wings. And finally it is a fish. 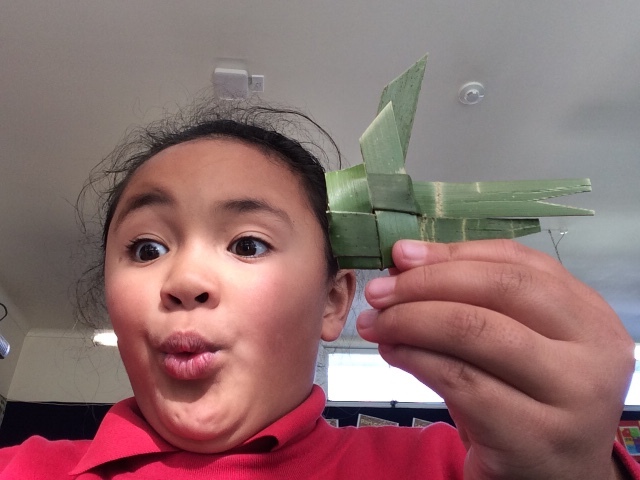 Nice fish Jasmine, you can teach Mama and Aunty Michelle how to make fishes out of coconut leaves when you go to Tonga, They have lots of niu trees there to create all sorts of handicrafts, like baskets, brooms, mats, hats, windmills etc..